I sometimes have to travel to London for work, and every once in a while, I find myself with an evening to kill and nobody to kill it with. This, I relish, and I spend most of my time wandering around the streets, just watching things happen. Often, I’ll walk around the West End and up Shaftesbury Avenue, turning into Gerrard Street, the main thoroughfare through London’s Chinatown. That turn might as well be a right-hander into a different universe, so distinct is the look and feel of Gerrard Street, a concentrated microcosm of Chinese life and culture. Ducks hang in the windows of restaurants, gleaming red with soy, the street names are mirrored in Chinese, there’s a huge oriental arch. Walking down that street, which I do slowly, relishing every step, is a wonderful experience, each restaurant bursting with people eating dim sum, Peking duck, noodles, the smells drifting across the street. And then, as quickly and abruptly as it began, it ends, and I’m slapped with the brashness of Leicester Square or Piccadilly Circus. Straight back to earth, back to London. It’s natural for people who migrate to want to live together and to carve out a piece of their own culture in their new home, and that brings a richness and diversity that we can all be proud of. These little enclaves, these Chinatowns that have sprung up in cities all around the world are important places for the Chinese who live in them, and give everybody else a glimpse into Chinese life, and more importantly, its food. Chinese food travels well. It’s exotic, it’s different, far removed from the European canon of cuisine. It’s flavours are big and bold, but there’s subtlety and precision there too. Above all, it’s delicious. 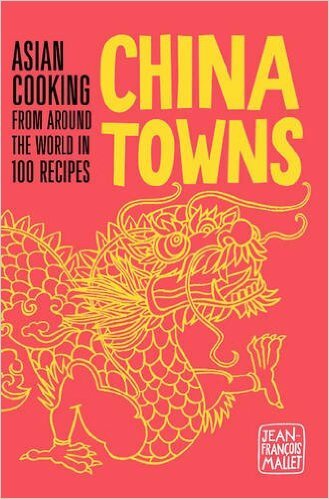 Jean-François Mallet’s book China Towns: Asian Cooking from around the World in 100 Recipes is a tour of some of the most important Chinatowns around the world, a journey told through a hundred recipes and nine restaurants. It’s primarily a cook book, primarily a collection of recipes, but those recipes tell a story of migration, settlement, of working and living together in a new place, of forging a life. Mallet describes how what we call ‘Chinese food’ often originates from the wider area of Indochina, encompassing Thailand, Burma, Malaysia, and Vietnam, and how it isn’t uncommon to have restaurants serving food from those countries next door to or nearby to more ‘traditional’ Chinese restaurants. It’s easy to forget, also, that China is enormous, and the food served at those ‘traditional’ restaurants is likely to be a culinary whirlwind tour of the country, dropping in at Szechuan for the fire and kick, Beijing for the duck, the southeast for the fish, and so on. This is a big hint that Chinatowns often play to their hosts, and why shouldn’t they? They’ve got a vast tapestry of flavours to draw on, so it would seem sensible to bend and mould those flavours and traditions to suit the audience. A good example of that is the structure of a menu – the Chinese normally eat everything together. There’s no such thing as a ‘starter’ or a ‘main’, but much Chinese food fairly naturally falls into one of those categories, and is presented as such for the Western diner more used to dealing with a menu split down into starters, mains and desserts. So, soup and spring rolls come first, whereas traditionally, they could come, well, anywhere. Mallet’s book is translated from French – he’s a regular in Paris’ Chinatown – and many of the restaurants referenced are based there. The translation gives the text a certain stilted quality at times, and there are one or two howling inaccuracies, the worst of which accidentally places the First World War 700 years ago, but setting that aside and concentrating on the beautiful photography and stunning recipes, China Towns leaves a rich impression of a vibrant culture and tantalising cuisine.